I am a very lucky chica. I have a great human family – Mama, you know her well by now; my girl and my boy, great belly scratchers whenever they are home; and last but never least, my Papa. When he picks me up like a football – gently, but securely tucked into the crook of his arm – well, I feel like I’m on top of the world. From way up here, I know I’m safe and sound. When Mama and the kids are not looking, he spoils me with bits of chicken and turkey. Though then he blames my less than petite waistline on Mama indulging me. And though he is not entirely comfortable taking me on walks by himself (he worries about his manly image with the neighbors) he never skips a chance to go with me AND Mama around the block. So on this special weekend for fathers everywhere, I’d like to tell you, mis amigos, a little bit about our very special love. we love to watch the movies together with Mama – he snores, I snore AND wiggle. 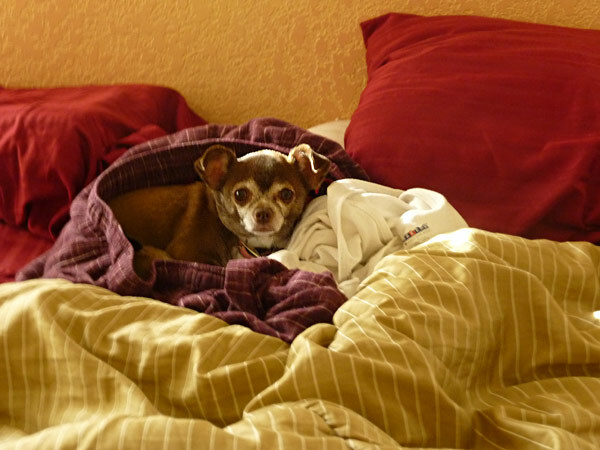 we love to bury ourselves deep under the warm blankets – muy nice and cozy, if a little crowded. we love to cook a special meal now and again and take over the kitchen with style and “flair” – mainly, again, I love the side benefits: mucho crumbs. 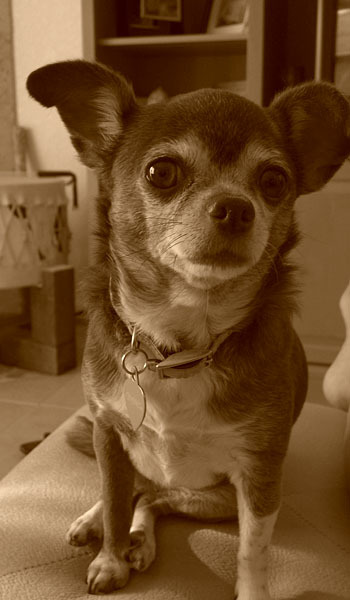 And to Coco, my original Papi: XOXOXOXO!! A beeeeg piece of my leeeettle heart is yours forever. Mama thinks there might be something wrong with my tongue. 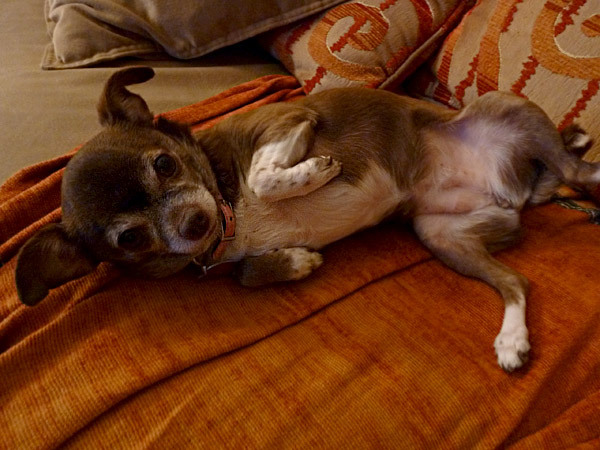 It seems there is a switch – the one that turns on when my tummy gets scratches – which gets stuck in that on position. Once she starts to scratch my belly and I start to tip over sideways in utter contentment … ahhhhhh, I just can’t stop kissing on her. Kiss-kiss-kiss-kiss-kiss … the Energizer bunny has nothing on me. I could go on like this forever! From the human perspective, of course, it looks and feels more like lick-lick-lick-sluuuuuuuurp-lick. But seriously, there is no “malfunction.” I admit lose focus in my state of belly-sctatching ecstasy. In my defense, I say she just gets sweeter with age and I just can’t get enough of my Mama. Sorry, Chica! 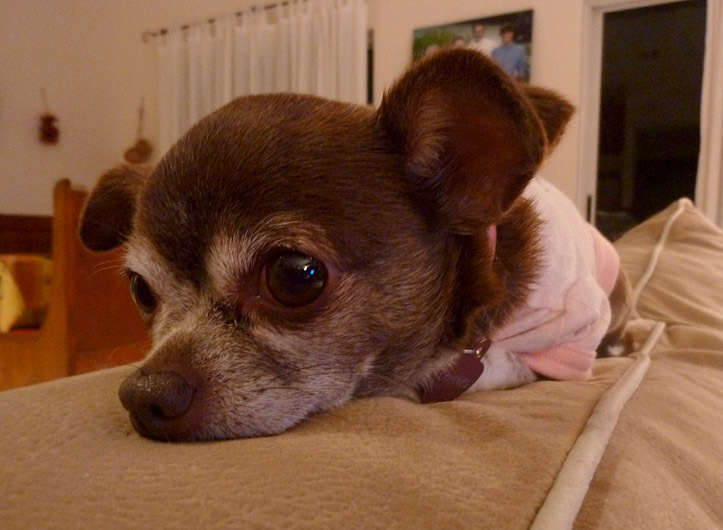 No exchanges, no refunds on chihuahua merchandise. Just love. Listen, if there is a special chica or handsome chico you’ve had in your love sights, share this ultimate serenade and watch it’s magic do the trick. GUARANTEED!! 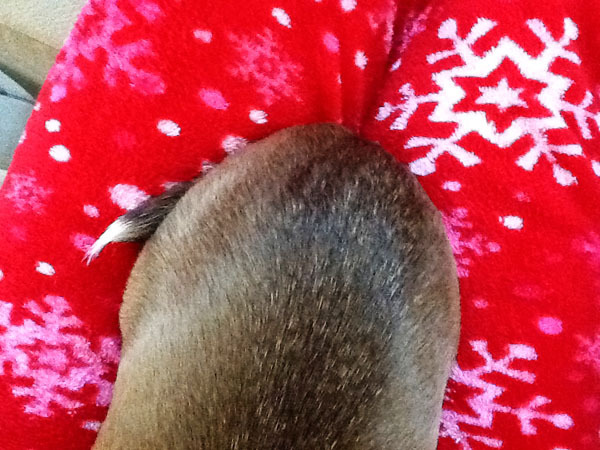 You are currently browsing entries tagged with lapdog at Chihuahua Wisdom Blog.